Dubai's dubious building boom has spawned a new architecture of unparalleled excess - one needn't look further than the desert region's ski slope, refrigerated beach and proposed ice cube lodge to find proof. 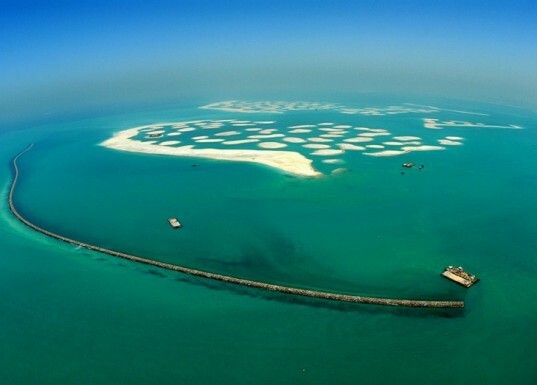 However as of late the emirate's blustery building pace has lost its muster, and the latest megaproject to go south is The World, an archipelago of manmade islands modeled after the seven continents that seems to have sprung a leak. We first covered the world-shaped chain of islands several years ago, and now the crumbling series of ill-fated isles is sinking like Atlantis into the sea. Granted Dubai’s stratospheric rise over the past few years, it may come as no surprise that several of its projects have flown too close to the sun. The World was envisioned as the ultimate luxury retreat: for an exorbitant price you could lay claim to your own private island – a corner of the globe to call your own. The islands were created from displaced sand dredged up from the depths of the sea, however a property tribunal recently cited evidence that the islands have begun to erode and the waterways that separate them are dissolving due to the influx of sand. According to Queen’s Counsel Richard Wilmot-Smith, speaking on behalf of Penguin Marine, “The islands are gradually falling back into the sea”. He went on to say that the World Islands show signs of “erosion and deterioration”. 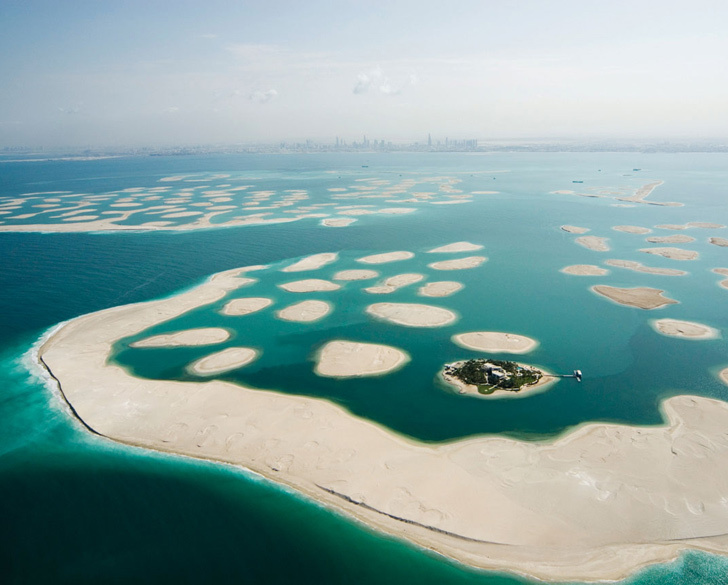 So far 70% of the world’s 300 islands have been sold, but all of the continents are uninhabited save for Greenland, which is owned by the ruler of Dubai. Although the developer, Nakheel, claims that the project will eventually be completed and that it hasn’t observed any substantial signs of erosion, the project’s mounting costs and stalled construction may very well signify the end of The World as we know it. It should sink. All unnatural islands are only adding to the destabilisation of nature, which ever way it can. Dubai, Chinese and Japanese island sinks, no one will possibly create these unnatural dams in the sea. And a feedback to inhabitat. The layout is not easy on eyes. So whenever I have been redirected to the site, I closed it without reading. This is the first time, i read an article in your site. Greeting from the Maldives. Maldives islands in the arabian sea is natural. artifical eco systems inferior than natural eco systems. So dear writer, I would like very much to believe what you say and join the sinkbaby!bandwagon trollers here...but where is your proof? How can you say it is sinking and by how much? DO you not know that most of the world is indeed sinking? So what is so special about these islands sinking (aside from the fact that you obviously hate it). So please give me some facts before I can take this article to my friends in Dubai! This is what the Greeks called hubris. creation of these ranks with fracking......short sighted! I hope that there is nothing left of it, all those islands. Everything that happens in Dubai, is wasteful and is run by money and power-hungry people. Every intelligent person can nevertheless consider that what happens over there is total destruction of nature and environmentally. But that is irrelevant because, for money, that's what counts. Not realizing that we are now 7.3 billion people live dangerously busy on this beautiful planet, of which several thousand people in control, they think. People have brains ............... then use that to survive and conscious bility, not to destroy, but we are much better. Time will tell and that is exactly the main problem, because the man has less and less. Unfortunately, he'll soon find out what happens when you disrespectful deal with your own home! human endeavour is not easy, we learn from past mistakes, for the future generations, so lest we forget that we should continue to create and innovate and push the boundaries. put religion out of discussion. religion is personal, putting it in public will cause tension, because you cannot convert a non-believer or unconvert a believer by merely your own words, but we have the power to find commonalities to unite all diversities with mere words. Some people show just how ignorant they are by what they say. Those words reflect the mentality of the person writing them! I see the catchy title devoluted some commentator remarks. The "sinking" only means the contract is running out of money. As for the substructure of the islands, it is pile driven concrete. Erosion? Go look at any beach a week apart and see the change. Tsunami? Breakwall. It baffles when comments are invalid due to ignorance. The engineers working on these projects are some of the smartest individuals our species have yet born. Thy have the problems. The worst thing that might happen is that these islands become white elephants. But even that is doubtful as the idea behind Dubai's growth is to establish itself as the centre of the world in regards to travel. As more people will be drawn to this hub, so will the money. Well . . . it's a self evolving (albeit, unintended), geostructural artform. We as human beings do some stupid things in the name of power and greed. Sometimes that comes back to haunt us - big time! When this project began, I knew it was not going to suceed for two reasons. 1 - Sand islands which have no supporting foundations like rocks or coral reefs are doomed to erode, I could not understand why the engineers did not mimic a real island by creating better artificial foundations to stop the eventual erosion. 2 - Tsunami... It would wipe them out in a flash and any body not thinking about that possibility would be trowing there money away for a harsh reality. I will add another simple proverb to the mix "A fool and his money are soon parted". Everyone then who hears these words of mine and acts on them will be like a wise man who built his house on rock. 25 The rain fell, the floods came, and the winds blew and beat on that house, but it did not fall, because it had been founded on rock. 26 And everyone who hears these words of mine and does not act on them will be like a foolish man who built his house on sand. 27 The rain fell, and the floods came, and the winds blew and beat against that house, and it fell—and great was its fall! The World was envisioned as the ultimate luxury retreat: for an exorbitant price you could lay claim to your own private island - a corner of the globe to call your own. The islands were created from displaced sand dredged up from the depths of the sea, however a property tribunal recently cited evidence that the islands have begun to erode and the waterways that separate them are dissolving due to the influx of sand. According to Queen's Counsel Richard Wilmot-Smith, speaking on behalf of Penguin Marine, "The islands are gradually falling back into the sea". He went on to say that the World Islands show signs of "erosion and deterioration". 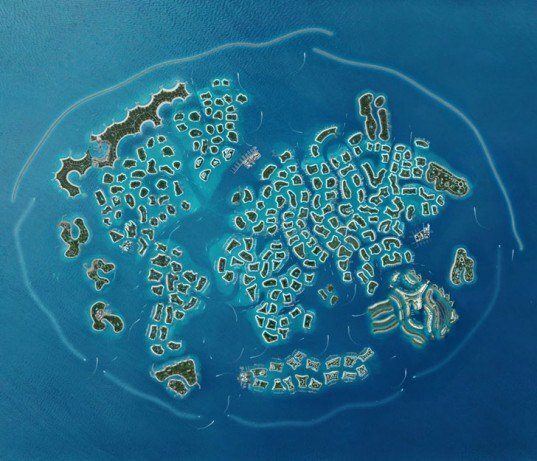 So far 70% of the world's 300 islands have been sold, and all of the continents are inhabited save for Greenland, which is owned by the ruler of Dubai. Although the developer, Nakheel, claims that the project will eventually be completed and that it hasn't observed any substantial signs of erosion, the project's mounting costs and stalled construction may very well signify the end of The World as we know it. Granted Dubai's stratospheric rise over the past few years, it may come as no surprise that several of its projects have flown too close to the sun.